I recently drove to four different grocery stores on a Saturday in Los Angeles, looking for rice paper. If you’re not familiar with weekend traffic in LA, be thankful. It’s far from fun. But I had been to Whole Foods a day earlier and discovered that they did not have any rice paper in stock. I was seriously jonesing for some Vietnamese summer rolls and decided that I was indeed desperate enough to spend an afternoon in traffic to satisfy my cravings. It was also the seven month anniversary of my mother’s death and I was feeling emotionally unraveled so I suppose I wasn’t in the right frame of mind to be making logical decisions. So I drove to one store after the other, looking for white rice paper. I found a couple stores that carried brown rice paper, but I’m sorry- I’ve used that stuff and when it’s not cracking and breaking before you can use it, it ends up making your rolls look like weird little turds. I bought something at every store I went to so I wouldn’t feel like my voyage had been made in vain, but after four stores, my search remained fruitless. Anyway, there’s a jackfruit sandwich recipe that I love in my upcoming book, But My Family Would Never Eat Vegan! (it’s actually on the cover of the book!) and it requires cooking jackfruit in a thick BBQ sauce and baking until it gets sticky and a little caramelized. It’s heavenly. Recently, I made the BBQ jackfruit for tacos and it got me to thinking- I bet I could cook the jackfruit in another sauce of similar texture and have similar results. A little more thinking and I came up with the idea to make Vietnamese-style caramelized jackfruit. It’s cooked in a hoisin-based sauce, and baked until it’s ooey gooey (not drippy-saucy) and it has a taste similar to that of caramelized pork. But it’s a plant. Amazing, right? So of course this wonderful new jackfruit creation ended up in my Vietnamese summer rolls along with some super thin rice noodles, carrot and cucumber matchsticks (or just “sticks” because I’m not sure they were skinny enough to merit the title of matchsticks), butter lettuce, fresh cilantro, and chives. Then I made a hoisin-based peanut sauce to dip those suckers in. 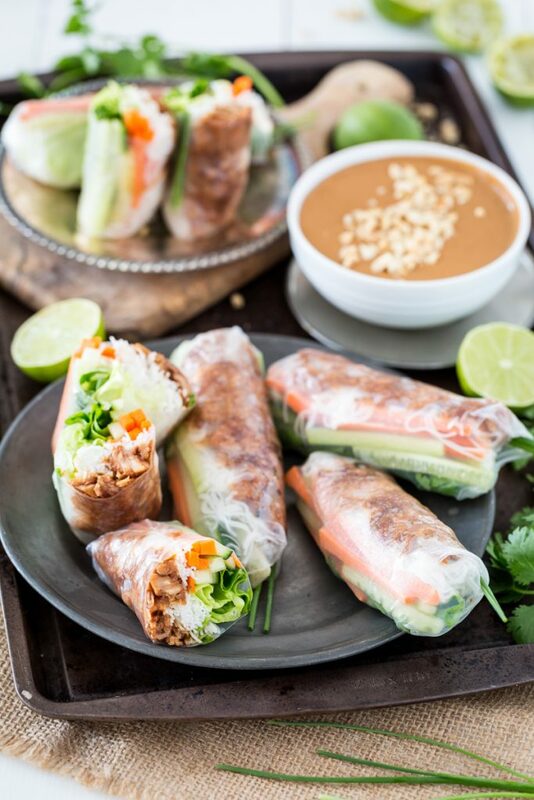 I know what you’re thinking and yes, the experience of eating one of these summer rolls dipped in that sauce is nothing short of magical. I mean, they’re not waffles, but still- they’re pretty amazing. After rinsing and draining the jackfruit, use your fingers to tear it into small chunks. Set aside. Preheat the oven to 400 F and line a baking sheet with parchment paper. In a small bowl, whisk together the hoisin sauce, tamari, rice vinegar, maple syrup, tomato paste, sriracha, and ume plum vinegar until smooth. Whisk in the arrowroot powder until fully incorporated. Set aside. Heat the sesame oil in a large, shallow saucepan over medium heat. Add the shallots and cook, stirring occasionally, until the shallots begin to turn translucent. Add the garlic and lemongrass and cook for a couple more minutes. And the Chinese 5 spice and stir until incorporated. Add the jackfruit and let cook for about five minutes, stirring occasionally. Once softened a bit, use two forks to tear the jackfruit into smaller, more shredded pieces. Add the reserved hoisin sauce (you may have to give it a quick stir before pouring) and stir until combined. Let cook for a couple minutes before transferring to the prepared baking sheet. Spread the jackfruit out into an even layer. Place the baking sheet in the oven and bake for about 25 minutes, stirring it and spreading it out again once halfway through. Once done, remove from teh oven and let cool, without stirring, for about 10 minutes. 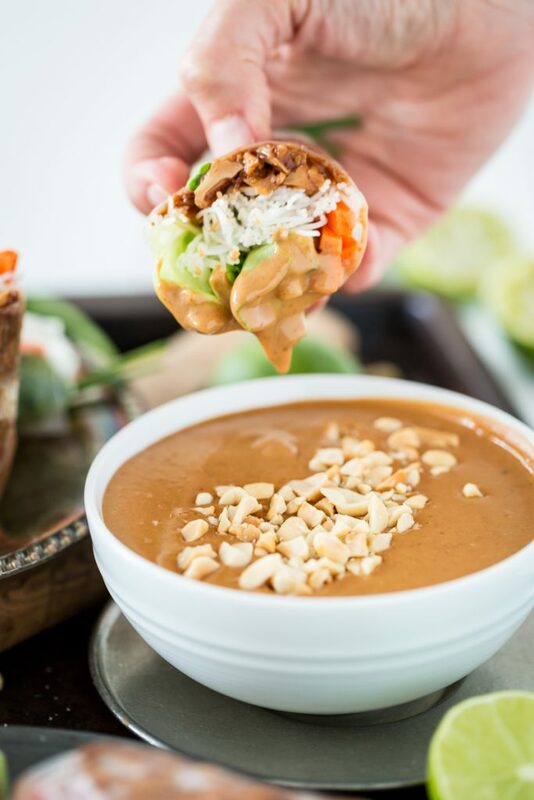 While the jackfruit is baking, prepare your peanut sauce. 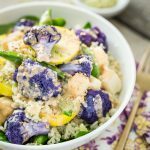 In a medium bowl, whisk together the sauce ingredients until completely smooth. If you desire a thinner sauce, you can add more water a tablespoon at a time until you reach your desired consistency. Chill until ready to use. To assemble: fill a wide bowl full of warm water. Dip one of the sheets of rice paper into the water and lay it out on a clean surface. 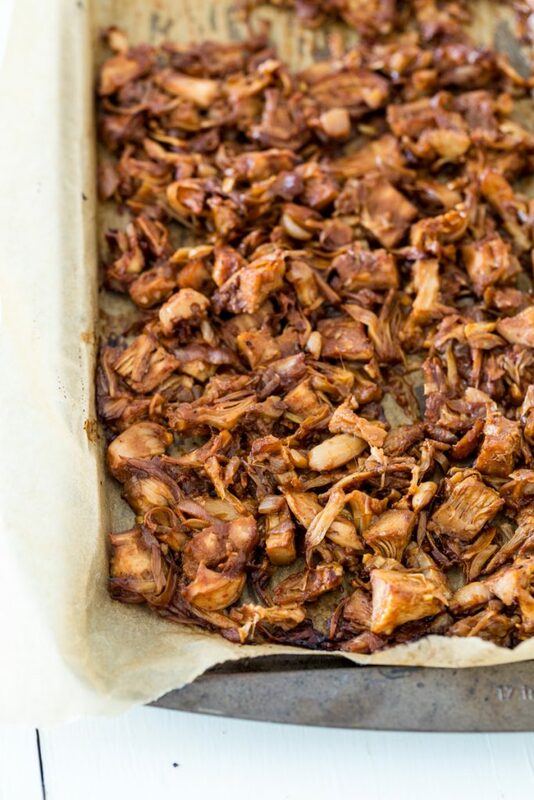 Lay out about 1/4 cup of the jackfruit mixture into a small strip on the half of the rice paper closest to you. Top with a small handful of the rice pasta (about a scant 1/2 cup). 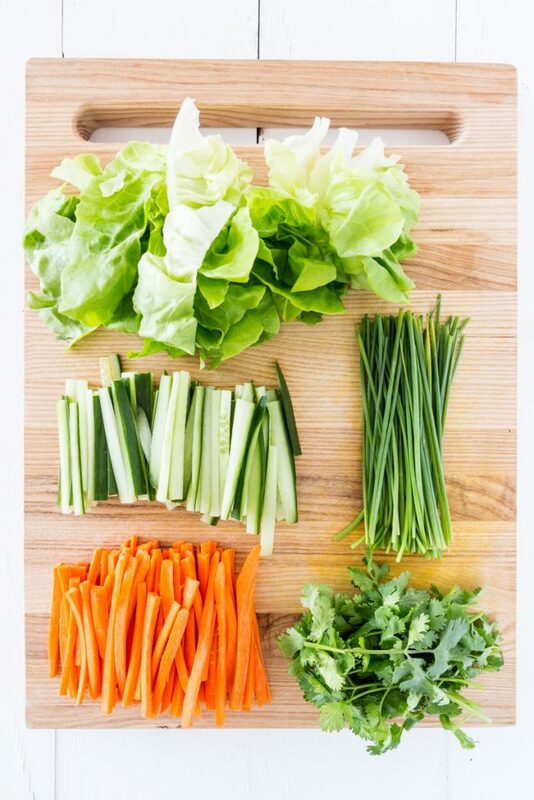 Lay out several carrot and cucumber sticks next to the pile of pasta, top with a couple strips of lettuce, and then add a sprig of cilantro. 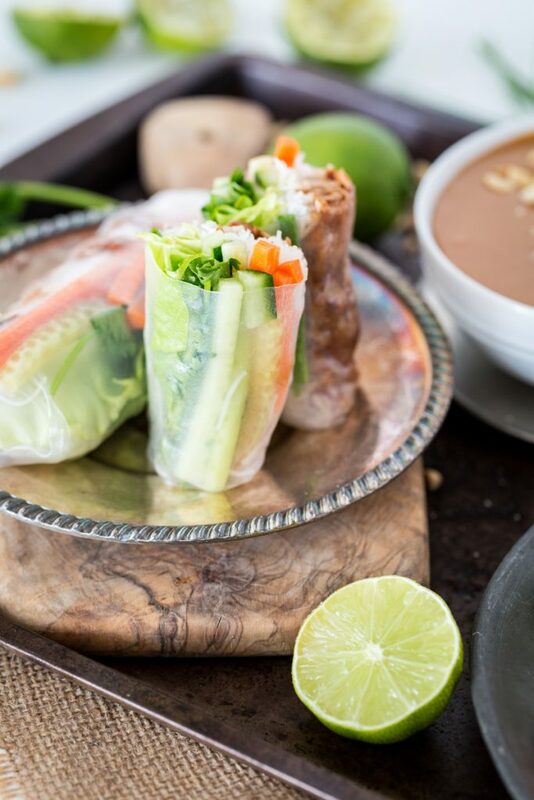 Fold the edge of rice paper closest to you over the pile. Fold the two side edges towards the center, and then roll the pile over once. Before you've rolled it all the way, add a couple chives, letting them stick out of one end, and then continue rolling until it is completely sealed. Please see this post for similar how-to photos. Repeat with the remaining rice paper sheets and ingredients until all are completed. If necessary, you can make fewer rolls and refrigerate the rest of the ingredients for a day or two to make the rest of the rolls. If you make all the rolls at once, you can refrigerate the completed rolls overnight and eat it the next day, if you'd like. You should be able to make about 14 rolls total. Enjoy! Jackfruit can typically be found in Asian markets but you can also order it online if necessary. Be sure to choose young jackfruit packed in brine or water, not syrup. 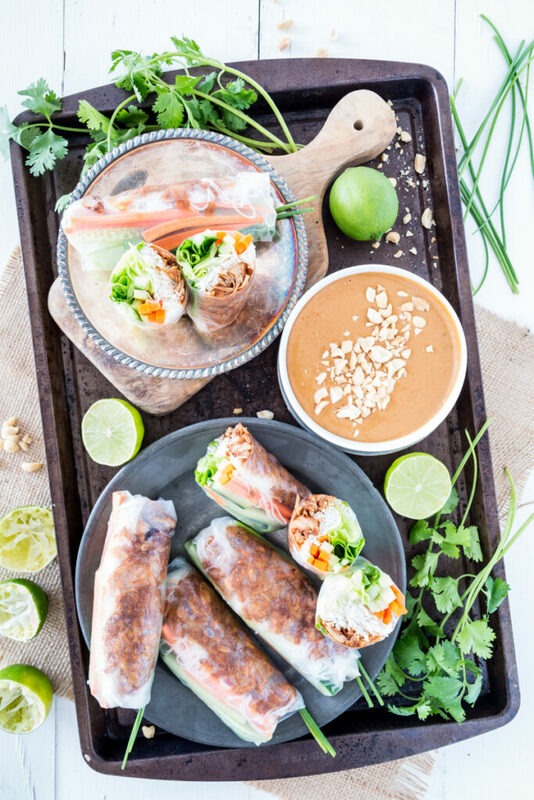 Sweet Potato-Black Bean Pasta Summer Rolls with Coconut-Lime Tahini Sauce + A GIVEAWAY! 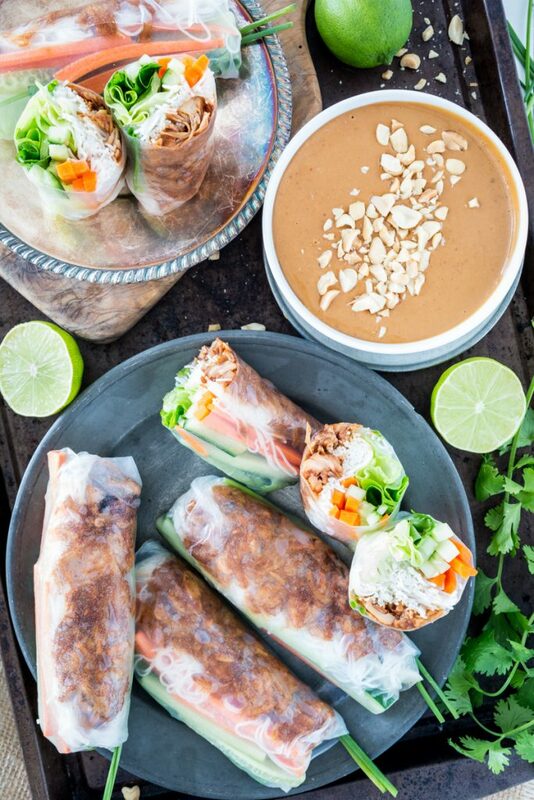 13 Responses to "Jackfruit Vietnamese Summer Rolls with Hoisin Peanut Sauce"
i wish i lived with you. That’s funny. I went to a local Asian market and they had a whole shelf of different kinds of rice paper. In Lansing, Michigan. They also had jackfruit in the produce section. Not canned. I did not buy any because I never save any jackfruit recipes because I figured it would be a pain to get. Now I can go back and get some. I did buy some rice paper because I LOVE spring rolls. Love, love, love them. Yeah, they’re kind of a pain, but once you have everything prepped, it moves pretty quickly. I’m Vietnamese :v This is quite cool! 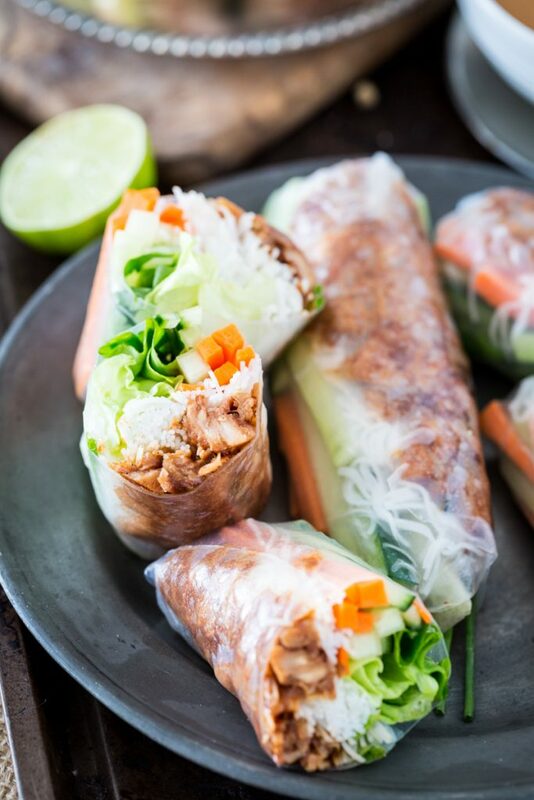 I’ve been having a major love-in with jackfruit lately and these summer rolls look and sound incredible! Also your story of LA traffic made me giggle as it reminded me of the SNL skit series called The Californians where all they do basically is discuss travel routes throughout LA in ridiculous surfer accents. It’s amazing. That’s weird, my comment is gone. I didn’t think it was offensive at all. Sorry- I was out of town and hadn’t had a chance to approve new comments yet. Thank you for stopping by! I Love Vietnamese food and try to get my hand on it whenever I can. These rolls look super delicious and easy enough to make at home. Thanks so much for sharing! Looks SOOOOO yummy! 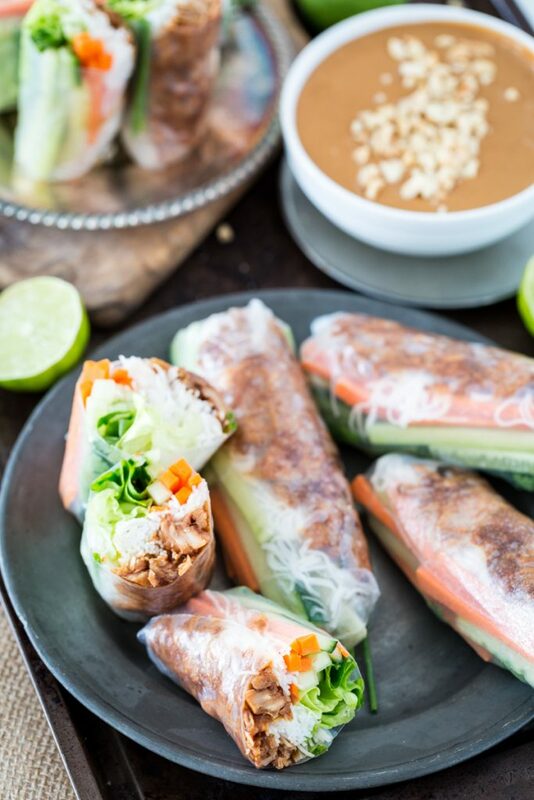 Spring rolls are hands down my favorite Vietnamese dish. And jackfruit is such an interesting fruit! Where do you get jackfruit in a can in LA? All I can find is the whole fruit(like all 30lbs of it uncut) at my local markets LA near little Bangladesh. I get it at the Samosa House market on Washington Blvd. in Culver City, though, I’ve heard that it is available at Trader Joe’s now! How long do you think these can hold in the fridge? I think they would keep for a day. It would be better to prepare the components ahead of time and then make them when you’re ready. Hey looks amazing..thanks for sharing this snack..great! !